Harold Weston Wall Painting Cycle | Cunningham-Adams Conservation Ltd. 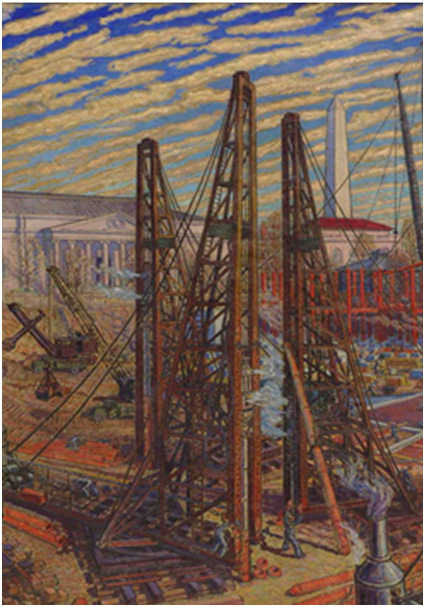 The Harold Weston cycle of eight large wall paintings and 14 smaller wall paintings celebrates the activities of the Procurement Division of the Treasury Department, the predecessor to the General Services Administration. The group of wall painting totaling 735 square feet adorns the walls of the main lobby of the General Services National Capital Region Regional Office Building in Washington, DC. The cycle was painted by the influential modernist painter between 1936 and 1938 in oil-on-canvas adhered to the wall. Cunningham-Adams was contractor and principal conservator of the paintings in the summer of 1993 in a major renovation of the lobby, a project that included installation of new lighting, marble cleaning, and repainting of walls, surfaces, and decorative trim. The paintings had been secured to the wall with a water-soluble protein-based adhesive. During installation, numerous large cuts were made in the canvas apparently to eliminate wrinkles and bubbles in what appears to have been a difficult installation. Over the years large regions of adhesive had failed and the wall had delaminated or its mortar deteriorated, much of which was a result of poor climatic conditions in the lobby. Past conservation interventions using unusual materials complicated treatment. Conservation was complicated by the artist’s practice of coating the canvas with a glaze of raw umber, and leaving portions of this glazed canvas exposed as an outline around objects. The delicacy of this glaze required unusual care during cleaning. Our conservation work included stabilizing the underlying wall; reconsolidating and stabilizing the painting; reducing surface distortions resulting from the painting and wall instabilities; securing flaking paint; surface cleaning; filling nicks and gouges; retouching areas of loss; applying a protective varnish; and removing and re-securing metal trim around the paintings. In addition, we advised the client on lighting and climate in the project. North wall mural 10’ x 20’, GSA Regional Office Building, treated in 1993.